Ireland’s weather, which is influenced by the Gulf Stream, does not typically deviate from its temperate maritime climate. Surrounded by the Atlantic Ocean, the Irish Sea and the Celtic Sea, these warm bodies of water keep the island from experiencing extreme temperature swings, with temperatures rarely dipping below 32 degrees or rising above 70 degrees. However, Ireland does experience four separate seasons, which, depending on the region, offer varying amounts of sun and rain. The eastern part of Ireland receives an average of 30 to 40 inches of rain, while most other areas will see between 40 and 54 inches. The rain falls an average of 150 days a year along the east and southeast coasts, to about 225 days a year in other parts of Ireland. The amount of rainfall starts increasing in the late summer and rains most heavily in winter. Because the rain only lasts for short periods of time, followed by the sun, the well-documented Irish rainbows are in abundance. From February to April, a typical Irish spring consists of 40 to 45 degree days and more clouds than sun, though both the sunlight and temperature are increasing as it gets closer to summer. The beautiful Irish summer, with its warm temperatures and long daylight hours, begins in May and lasts throughout July. During the summer, warm and sunny days abound, and if it rains, it is limited to light showers. Late summer brings increased humidity and the chances of thunderstorms and lightening. July temperatures hover around 60 degrees, although higher temperatures are not uncommon. Ireland’s warmer weather continues into autumn, which runs from August through October, though it does start getting cooler and rainier. Average temperatures hover around 50 degrees. The winter months of November, December and January are generally the wettest months of the year with mostly cloudy weather and rain, with some sun peeking out occasionally. Mountains will have snow on them, but snow does not stick to the ground in the lower regions and is not generally seen. Frosts occur semi-regularly. The daytime temperatures run about 40 degrees on average. 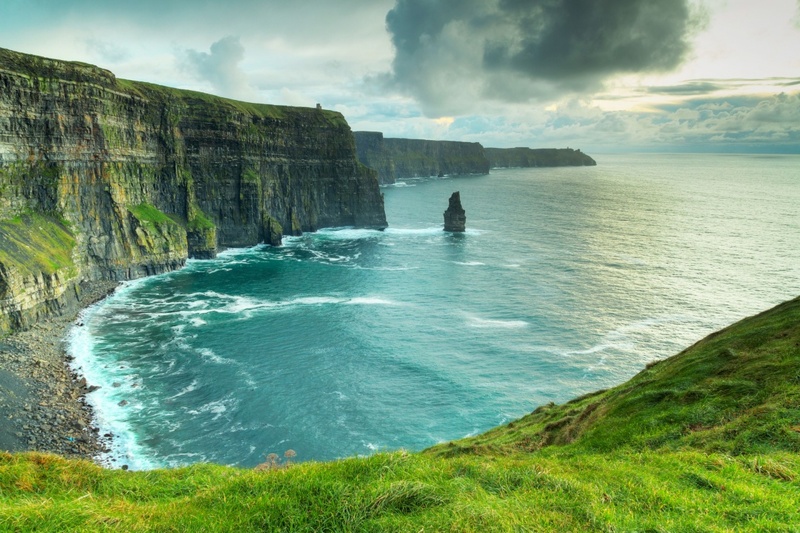 Generally speaking, Ireland’s weather patterns throughout the regions are fairly consistent, but they start diverging when comparing temperatures of an inland mountainous region to a coastal region. For example, the southwest area of Ireland receives the most rain, while the southeast area of Ireland is the driest. Cork and Galway have similar summer temperatures to Dublin, but slightly warmer winter months. However, in the winter and spring December, these areas will experience 30 percent more rain. In the fall, twice as much rain falls in the western half of Ireland than in the eastern region.